The Expert Advisor places the necessary amount of BuyStop and SellStop pending orders with predefined StopLoss and TakeProfit levels at the specified time daily. The EA calculates the channel width using the ZigZag indicator and sets a grid of BuyStop and SellStop pending orders according to the specified settings. 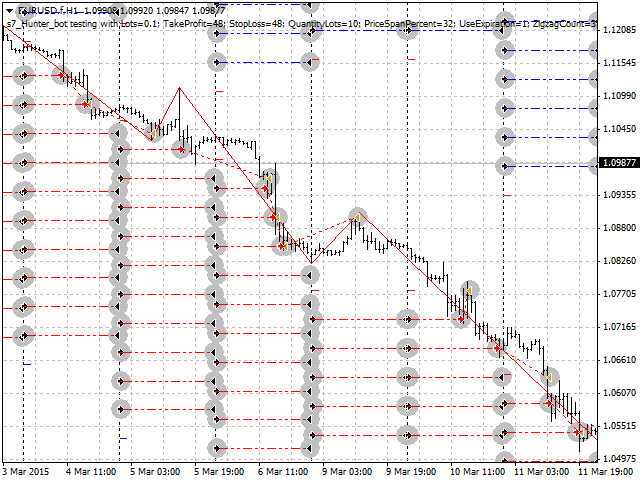 The first pair of BuyStop and SellStop pending orders is placed at a predetermined distance from the channel borders. The distance is set in the percentage of the calculated channel width. The channel width is calculated by the specified amount of the ZigZag peaks. StopLoss and TakeProfit levels are set for each order (specified in the parameters). The next pair of orders is set at the TakeProfit level of the previous one. Pending order placing time is set in the EA parameters. The time of non-activated pending order removal is also specified in the parameters. The EA distinguishes between 2-3 and 4-5-digit quotes. Parameters' values are set in points (the second or the fourth decimal place). The EA works on any symbol and timeframe (TF). You can set a special number to distinguish the EA's orders from orders of other tools. You can attach the EA to different charts with same instrument but different parameters. In this case, you should set different numbers for each chart. You do not have to change a number if charts have different instruments. There won't be any confusion. Minimum profit when break-even, pips - the value of the breakeven points. Depth is a minimum amount of bars that will not have the second maximum/minimum less/more by Deviation pips than the previous one. Backstep is a minimum number of bars between maximums/minimums. 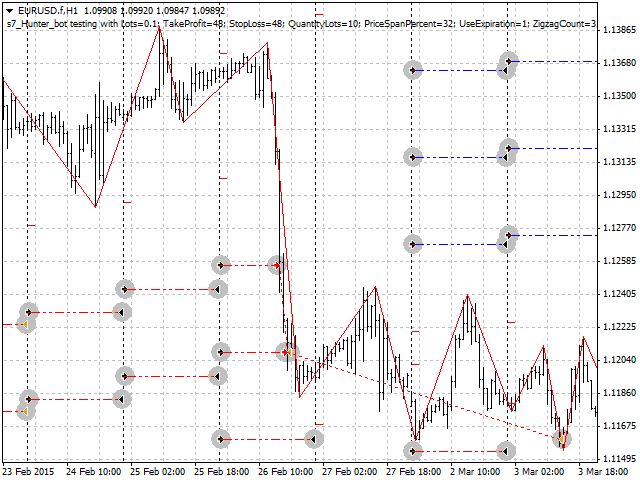 It is reasonable to set the indentation of the first pair of pending orders by Fibonacci levels - 23.6, 38.2, 50.0, 61.8. The EA can be used instead of the Hunter on the channel breakout BuyStop SellStop script for the automated setting of an order grid. Figures indicate an example of the EA setting and its testing in the strategy tester. The last six months are used for the test. 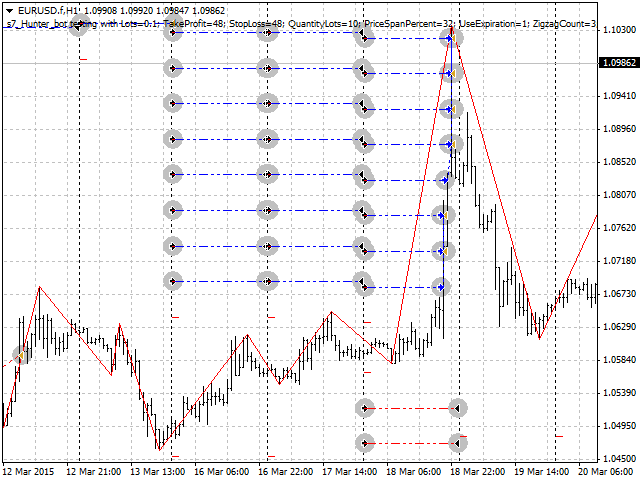 The parameters are set with no selection and optimization: Parameters Lots=0.1; TakeProfit=48; StopLoss=48; QuantityLots=10; PriceSpanPercent=32; TimeStart="01:00"; TimeEnd="23:30"; UseExpiration=true; ZigzagCount=3.